Bill Carlisle was a very interesting character of the old west. He was referred to as a gentleman bandit. Bill Carlisle was born on May 4, 1890 in Pennsylvania, the youngest of five children born to a civil war veteran. His father was 60 years old when Bill was born, and his mother was 37. His mother died when he was nine months old, and Bill was sent to live in a babies’ home. At the age of three he was taken by relatives and was passed from family to family. He was a poor student and spent three years in third grade. He did learn to read and to spend the money he earned on a paper route. As a small boy he was forced to steal lumps of coal from the railroad to burn for heat at home. As a teenager he started riding freight trains, and at seventeen, he rode the train to Montana where he was hired as a ranch hand. On May 1, 1916 he was sentenced to life in prison, although he never shot anyone during the robberies and did not take money from women and children or servicemen. Carlisle eventually worked his way into Wyoming and robbed his first train on February 9, 1916. The Union Pacific passenger train was traveling between Green River and Rock Springs when Carlisle, wearing a white mask and brandishing a gun, woke a sleeping porter and ordered him to take up a collection from the passengers. One gun that he carried was a toy glass gun that was intended to be filled with candy. Carlisle escaped from that train by jumping off of the top of a car; the glass gun bounced out of his pocket and broke. Carlisle rolled away from the track, and hid in bushes while the posse was searching for him. He eluded the posse and held up the Overland Limited on April 4, 1916. He again had the porter pass the hat. On April 21, 1916 near Hanna, Wyoming, he again surprised everyone and robbed the passengers on a train. A posse, led by Sheriff Rubie Rivera of Rawlins, was called in and Carlisle was captured the following morning. On May 1, 1916 he was sentenced to life in prison, although he never shot anyone during the robberies and did not take money from women and children or servicemen. Carlisle was taken to the state penitentiary in Rawlins, Wyoming where he was a model prisoner. He followed all the rules, attended classes, and did whatever job he was given to do and even did more than his share of work. While he was in Prison he was working in the shirt factory. He was missing one evening, but he was known for working late if he was loading a truck, so his disappearance did not cause alarm. On November 15, 1919, Bill Carlisle escaped by being carried outside of the walls in a packing crate with the regular shipment of shirts. It was snowing when Carlisle stepped out of the box. By now a posse was searching for him. He boarded a train to Creston and took up his “collection”. When he finished he jumped off the train and was shot in the wrist by a member of the posse. He was followed for two weeks by the posse and at one point he could have shot a sheriff but he did not want to kill anyone. Once he was finally caught by the posse, he had a severe infection from the bullet wound. He was returned to prison on December 18, 1919. Bill Carlisle was truly one of the last of the cowboy bandits! He also was a gentleman bandit. 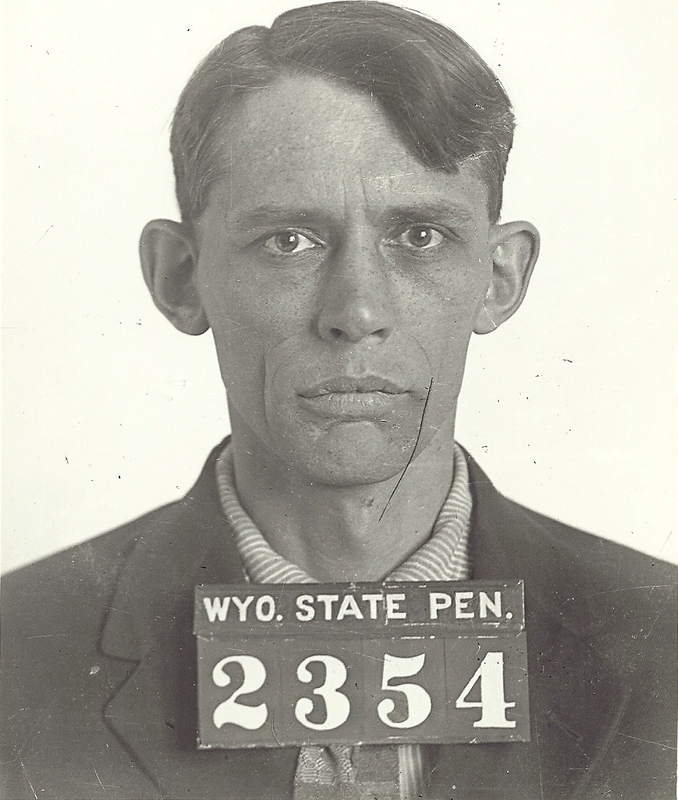 He was paroled from prison on good behavior in January 1936 and in 1947 he received a full and complete pardon by the Governor of Wyoming. He married his nurse who took care of him while he was ill, and after his parole they moved to Laramie, Wyoming and opened a motel which flourished partly because of his reputation. He returned to Pennsylvania in 1962 and died there in 1964 at the age of 74. In an interview with Carlisle before his death, he said he did not know why he committed those crimes. “Would I do it again? No, I have given it a lot of thought over the past twenty years; I’ve had it so much better. It makes a man see what he has missed.” Bill Carlisle died of cancer at the age of 74.